The board sports the signature Fatal1ty color scheme of black and red, and is geared for high-end gaming PCs. The AM3+ socket is powered by a 14-phase digital PWM power design, which is ready for even 140W chips. It is wired to four DDR3 DIMM slots supporting dual-channel DDR3 with speeds of over 2000 MHz by overclocking. 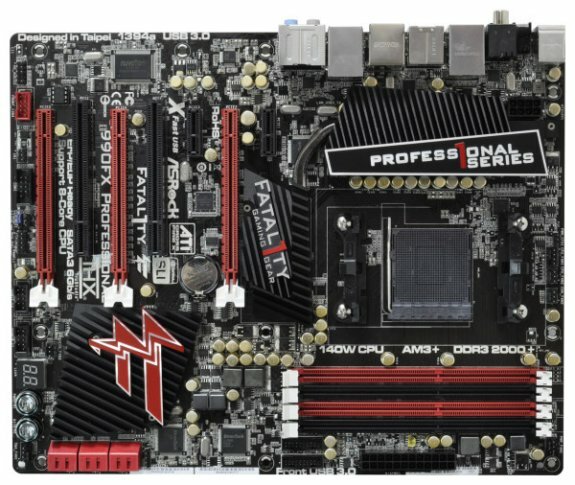 Two of the unique selling points here is ASRock Fatal1ty XFast USB, a pair of low-latency and high-polling USB ports to plug in your gaming mouse and keyboard; and XFast LAN, which is a software layer that works to lower latency and prioritize internet bandwidth to applications. To top it off, there's a Fatal1ty-themed UEFI setup program that features some extra advanced settings.